I was interested in investigating SS amps to run restored Apogees. 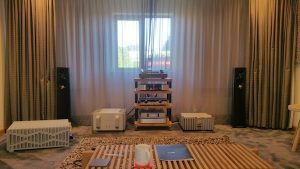 Then I had no idea about how a Luxman sounds and it was at the bottom of my list of SS amps, with Ypsilon as the running favorite for a higher powered amp. 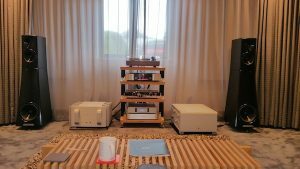 I therefore went to Joel’s, who is a 6 moons reviewer and editor of his own audiophile mag (www.audiophile-magazine.com), and who owned both the Luxman m800 monos in bridged mode, and the Ypsilon Aelius. I did hear the Aelius thrice during this period, including this direct compare, and was totally surprised by how easily I liked the Lux more on all factors that mattered to me. Joel has also tried the bridged M800 on Maggie 20.7s, and he has had substantial experience with SS amps, including running the Karan M2000 and the Chord on the Maggies, and he too confirmed my Luxman impressions. 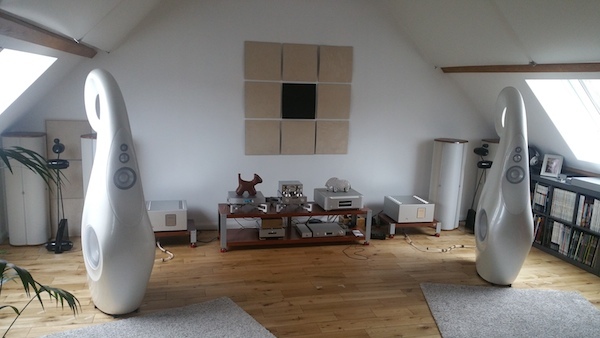 In that system, Lux seemed more solid, with better tone, mid bass, bass, and a non-fatiguing musicality. I then checked with other Lux owners, and found that they had either moved from, or preferred it next to powerful valve amps like VAC. Dpod4 on Audioshark too mentioned he had demoed CH precision and other amps, and preferred the Luxman M800 bridged on his Maggies. 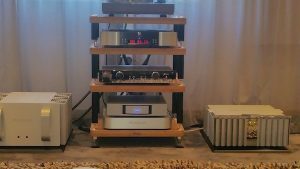 Soundstage hifi rated the M900 as the best amp he had heard,. For those confused, the m800 has now been discontinued, and we have the m900u. The m800 was 60w pure class A, with bridged g0ing upto 240 * 8 ohms, and doubling down from there (480 * 4). The m900u is 150w with 12w class A, and in bridged mode goes up to 600w * 8 ohms, and doubles down from there. The m900 is known to be more stable and resolute. So for its price the Lux seemed good enough, but obviously the gearhead in me wanted to tick the boxes. I had heard good things about Viola, but had never heard one. I went to Paris to Acoustic Gallery (very knowledgable and honest dealer/distributor) to listen to the Viola Symphony, and did a direct shootout. I easily preferred the Lux much more. The Lux was more organic and full bodied, and real. The Viola was faster and had more extensions at either end, but I found that its speed and dynamism to be not as easy as Spectral’s. Seemed forced with the TADs. Compared to the Lux, it was more fatiguing and metallic in this system. Maybe it needs the Viola preamp. As for the bass, in the Lux it can be increased by bridging two blocs. And it is just rock solid and musical. The distributor mentioned they had done a shootout of his speakers the previous evening – TAD, YG, Rockport, and Marten, and people had preferred the YG. So we moved the YG Hailey into place, just for a brief listen as I was about to leave, and I was amazed. These speakers were like Quads in resolution, midrange, and openness, with more bass and dynamics. 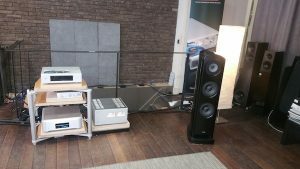 Plus they seemed like speakers that would fit into any living room, no special room size or shape required (a big consideration for me). They may not be like giant horns or panels, but hey, they are just place and play, walk around without any room invasion, and yet get a top sound. Well, almost. These speakers, like highly accurate speakers, can easily start sounding edgy, metallic and like bad digital, if not set up properly. But here the set up has more to do with the electronics and accessories, and less to do with the room. I checked with another London audiophile named Barry (Barry2013 on WBF), whose Kipods and Carmel 1s I have heard before, and he mentioned that Criterion Audio just outside London had a pair. Now, Criterion Audio turned out to be a SS amp goldmine. Visiting Criterion, I heard the YG Hailey with Burmester pre, and the Plinius, Burmester 911mk3, and Boulder 2160 amps. Both here and in Paris noticed the YGs have a much more decay like stats, openness, musicality, and space, and are full instead of lean in the mid bass like some other metal speakers. Boulder was the best of the bunch. A 600w class A beast, with a giant special connector. Amazing how it handles space and nuances, inflections in vocals with a continuous flow – so SET+ horn like. And we played it from the cold, while others were warmed up over night. Too expensive, but am a fan. A single bloc of Lux in a big room made the YG sound a bit bass light (requires subs), while the Boulders and Burmesters seemed to give it sufficient bass, or it could be that the speakers in this smaller room were close to the walls. Either way, bridging Luxmans should fix that problem. I have heard the Plinius’ on Apogee Duettas before and they are excellent for their price, in class A. The Boulders are among the best SS amps along with the Vitus class A, a different sound, but frankly at their price Boulder is a luxury few can afford. Luxman is my choice for SS amp due to the incredible value, and flexibility to bridge. And no, I am unable to provide any opinions on Luxman vs Boulder or Burmester as I heard the Luxman’s in a separate room. 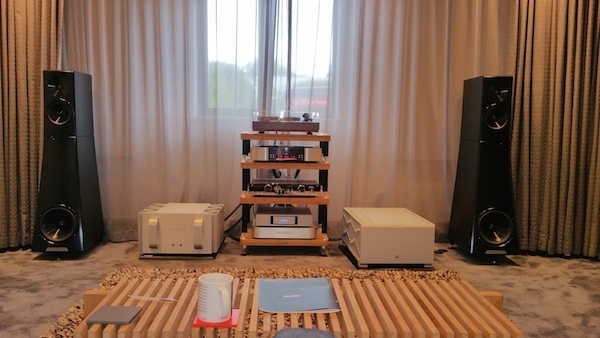 Price wise, the Luxman seems a no brainer compared to the others. I have never heard the Accuphase A70. It would be interesting to compare the Lux and the Boulder. Mind you, the Lux does not startle you with the bass and dynamics of the Spectral, or a bass grip like Krell, or valve like harmonics. What it does is, it just plays solidly, with a great tone, organic sound, 3d, and it is only when it is taken away and replaced that you realize what you were missing. I can easily see it sounding great on restored Apogees. Also, money aside, I can’t see an alternative for YG Hailey for a normal living room speaker. Fits right in and sounds great, if matched properly. At that budget, the Stenheim Alumine 5 is probably a sole competitor. Dallasjustice on WBF owned the m900u and YG and now think owns the m900u and the JBL waveguides.